KWAME QUEE ICELAND UMF Vikingur. 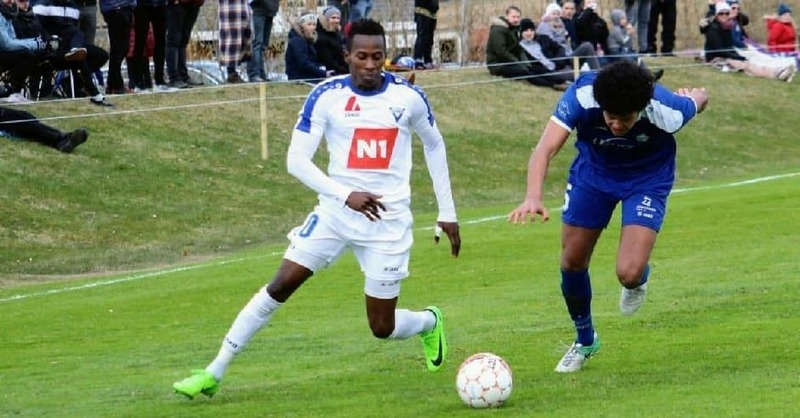 The imposing offensive midfielder, Kwame Quee, scored his first league goal of the season as UMF Vikingur thrashed IF Leiknir 3-0 on Wednesday. Quee, 21, who has been part of the recent Vikingur squad since 2017, goal came in the 92nd minutes of extra time. Alexander Helgi opened the scoring in the 50th minute for the Icelandic Deild league side and late on Quee double their lead. The win lift Quee’s side to fourth after four wins, a draw and two defeats from seven matches this season. Ibrahim Sorie Barrie, another Sierra Leone international was also on duty for the Icelandic second-tier side. Barrie, who scored his first league goal in May against IR Reykjavik, joined the club on loan from FC Kallon. No win in their opening eight league matches this season. TP47 have lost seven of their last eight in Finland. Their poor start this season has seen them struggling at the feet of the league standings. Attacking midfielder Sesay and striker Koroma, both Sierra Leone internationals are looking for their first league win this Saturday. The Tornio-based club will take on Tampere United desperately searching for maximum points. They are first from the bottom with a single point from eight Group C Third-tier Kakkonen matches this season. Sesay joined compatriot Koroma in April after leaving JS Hercules where he played last season. Davies’ Virslīga team defeated Jelgava 1-0 on Friday striker Darko Lemajiča scored his side only goal in the 67th minutes. However, the Sierra Leone-born was missing in action reason unknown. Since his debut, the versatile player has played over 460 minutes this season for the Latvian side. Manager Mikhail Konevs has been impressed with the former SKN St. Pölten attacking midfielder. Their next game is on June 21, when we will take Ventspils at the Skonto Stadium in Riga. Kamara’s Kaisar will commence their 2018 second round top-flight campaign at home on Sunday against Zhetysu, hoping to improve from a bad first round run. FK Kaisar has only managed two victories in 13 matches’ losings five and six draws amassing 12 points leaving them third from the bottom. The 30-year-old still a key figure for his struggling side. He made 30 appearances last season and scored a goal. Kamara double and first-time captain as Whitecaps cruise past Orlando City. Kei Kamara scored twice and registering his sixth MLS goal of the season to help Vancouver Whitecaps beat visiting Orlando City 5-2 at BC Place on Saturday afternoon. The Sierra Leone native, who skippered his side for the first time in his MLS career, opened the scoring in the 36th-minute assisted by Alphonso Davies cross via the left flank. Kamara added the insurance goal for his second from the penalty spot in the 85th minute after Reyna was brought down inside the Orlando box.